An awesome cookie any time of the year, but particularly for your Christmas parties due to it's festive colors...it's one of my favorites. Cream together first five (5) ingredients until you get a smooth consistency. Add in Flour, Salt and Cherries...mix well. Let dough rest in refrigerator for 30 minutes. Form balls and place on your parchment-lined cookie sheet. Smush cookie balls with a glass dipped in sugar. Bake 8-10 minutes until bottoms are light brown. 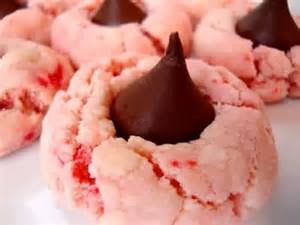 Remove from oven and immediately press a Hershey Kiss into each cookie.